As I walked between the rows of blooming pink and yellow tulips, a driver on FM-2931 honked his horn in a cheerful rhythm. And that’s the way it is when you are near Texas Tulips and see the hues of tulips in various stages of bloom: Joyful! We have Petra and Pieter Koeman, and the TV series “Dallas”, to thank for these fields of wonder. You see, as a young adult working in his parents’ tulip business in Holland, Pieter religiously followed the ups and downs of the Ewing family each week, taking in the sweeping views of the Dallas landscape during the title sequence of each episode. He vowed that one day he would move to Dallas where he would run his own tulip farm. After years of perfecting the trade with his parents, their production of millions of tulip bulbs were commanding peak price at the world’s largest flower auction, The Aalsmeer Flower Auction. After his father’s passing in 2011, Pieter called a realtor he found on Google and told him of his plans to start a tulip business in Texas. A week later when Pieter and Petra arrived in Dallas and phoned the realtor, the realtor was stunned to realize Pieter was serious. And off they set for the best location suitable for tulips. As it turns out, the sandy soil in Pilot Point favored by equine owners is also ideal for tulips. Rancher Jerry Bobo sold his 26+ acres to the Koeman family, who immediately set to work creating the destination visitors enjoy today. Today you will find 90 varieties of tulips at Texas Tulips. 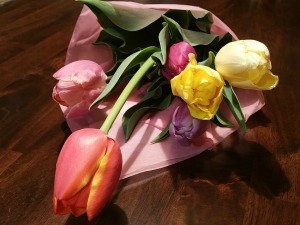 If you have an opportunity to meet Pieter and Petra, their children or any of the family members who help them at Texas Tulips, you’ll feel like you’re visiting at a friend’s home. Their warmth and excitement for bringing this Holland tradition almost halfway across the globe is evident. That could be why Mr. Bobo stuck around and now assists each year at the entrance to the flower fields. 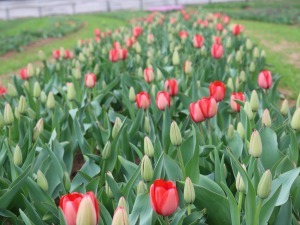 What passersby see as a small miracle each winter at Texas Tulips is the result of hours of hard work. Each year new bulbs are ordered and planted, with each bulb producing one stem for the entire season. (The summer Texas heat is too much for the bulb to be reused.) Each year the rows rotate between grassy walking paths and mounds of tulips. Is Texas Tulips an Authentic Reproduction of the Tulip Fields in Holland? We met a visitor, Larry, who had relocated to Texas from Holland. He, his wife and two children were enjoying the tulip fields where he told us he came to visit to feel a little closer to home. Larry assured us that this field was an excellent representation of the fields he enjoyed back in The Netherlands, albeit on a smaller scale. Walking to our car we were discussing where to get a bite to eat. As we pulled out of the parking lot, we saw a large sign for Mom’s Home Cooking in historic Aubrey, so we took a chance and tried it out. Hubby ordered the Kitchen Sink Burger ($12.99) with fries and I, the Chicken Fried Steak ($11.99) with red potatoes and fried okra. We also split a piece of buttermilk pie ($4.99), which was huge. The food did indeed taste homemade as advertised, which is a treat in these days of fast food. 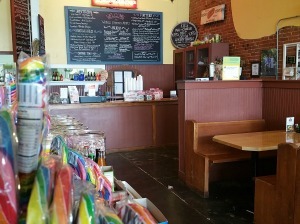 The place was quaint and a fun stop. If you’re searching for fast food, head south on FM-424 and 380 where you’ll find many choices. After a rain, it is best to wear your rubber boots as water may sit in low lying areas. A hose is provided to clean off before walking to your car. Plastic booties were provided for our shoes. The weather is difficult to predict and is responsible for the bloom season. Best prediction is the blooms will last until about March 20. The next two weeks (February 21-March 10, 2017) will probably be the best time to visit. A hay maze is available at no additional cost for children to enjoy. Portable toilets are available on site. Watch their Facebook page for bloom updates.